K4 Great Taste Eve Bash! « Beer Sampling for St. Elizabeth’s Hospital! It’s Great Taste Eve and we’re having a bash here in our taproom all day long. We’ll have 2 special Barrel Aged Champagne Tortoise options. 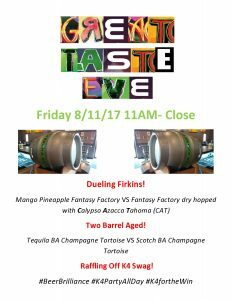 AND we’re going to have dueling firkins! Come on down and party with us!